New York, 1980: three complete strangers – Bobby Shafran, Eddy Galland, and David Kellman – make the astounding discovery that they are identical triplets. Separated at birth, adopted, and raised by three different families, the 19-year olds are reunited by chance. Their story sets the tabloids on fire, and the triplets suddenly become famous around the world. "...their fairytale reunion sets off a chain of events that ultimately unearths an extraordinary and sinister secret..."
The brothers forge a relationship and become fast friends. They move in together in a swinging bachelor pad and open a restaurant that skyrockets to success. The toast of Manhattan, the triplets are living the high life. But their fairytale reunion sets off a chain of events that ultimately unearths an extraordinary and sinister secret that could answer controversial questions at the heart of human behaviour. Making his feature film debut, BAFTA award winning television director Tim Wardle has crafted a gripping, juicy conspiracy thriller that becomes so much more complex. 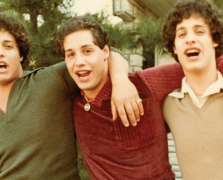 Three Identical Strangers evolves from pulp nonfiction into a multi-layered deliberation on nature versus nurture and the existential dilemma of what makes us who we are.